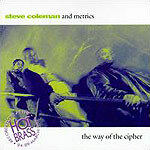 CD reviews: "Steve Coleman's Music: Live in Paris at the Hot Brass," "Myths, Modes & Means: Live at Hot Brass," "Way of the Cipher: Live at Hot Brass" and "Curves of Life: Live at Hot Brass"
This review first appeared in the May 23, 1997 issue of the North County Blade-Citizen (now North County Times). Steve Coleman is, along with David Murray, his generation's Ornette Coleman  pushing, always pushing the form, always testing the limits, and always doing so with a larger vision of the music. Like Ornette, Steve Coleman  no relation, by the way  plays alto saxophone. And while Steve is a fine player, the instrument seems almost incidental to his music. He's like Duke Ellington in that way, more of a conductor and composer than an instrumentalist (although Ellington was a hell of a piano player). Coleman's latest releases collectively comprise a three-disc box set recorded a couple years ago in Paris, although they can also be purchased individually. 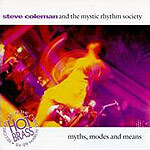 The three discs ("Myths, Modes & Means," "The Way of the Cipher" and "Curves of Life") find Coleman fronting three different combos: the Mystic Rhythm Society, Metrics and Five Elements, respectively. As with his earlier M-Base Collective, Coleman's newest discs find him still playing an urban, pulsating jazz that incorporates rap and hip-hop. Like much contemporary music from the inner city, this has a hard edge to it and an underlying anger. And as with all good art, that anger, that emotion, is kept in check and used to give the performance a fine edge. This is not music for the timid; it is loud, brassy and muscular, and Coleman often uses dissonance and discomfiting harmonies. But it sure swings, and shows jazz as  again, finally  reflective of the music of young black Americans.